Reference archivists at Library and Archives Canada (LAC) are often asked to assist researchers in tracking down patents for Indian land sales. Over the years, we’ve noticed that there is much confusion surrounding these records; specifically, what they are, what is held at LAC and how the records can be located. I hope that I can clear up some of this confusion. What are Crown land patents? Crown land patents are legal instruments issued when a territory in the Crown’s possession, such as a First Nations reserve, is divided and sold to a private individual or corporation. In Canada, First Nations reserves are considered to be federal Crown lands because they are owned by and are in trust to the Crown. LAC holds a number of the Indian land sale patents issued since 1763, though most of these records are still held in provincial archives. Who issued patents for Indian lands? Until 1845, the provincial secretaries for Upper and Lower Canada issued Indian land patents under the province’s Great Seal. Following the 1840 Act of Union between Upper and Lower Canada, the Office of the Registrar General was established for the united Province of Canada, assuming the responsibilities formerly held by the provincial secretaries. By the time of Confederation in 1867, the provinces had become responsible for most Crown land sales, with the exception of lands held in trust for First Nations reserves, which fell under the authority of the federal government. The newly created federal Office of the Registrar General became responsible for issuing Indian land patents across Canada. By 1886, this responsibility had been transferred to the Department of Indian Affairs, which retained the function until 1951. Since then, Indian land patents have been the responsibility of the Registrar General of Canada, though it should be noted that the last Indian land patent was issued in 1990. What records are held at LAC? Today, Indian land patents held at LAC are located in a variety of fonds, including the Department of Indigenous and Northern Affairs (RG10) and the Registrar General (RG68), and can therefore be a bit tricky to track down. Below is a list of the Indian land patents held by LAC. 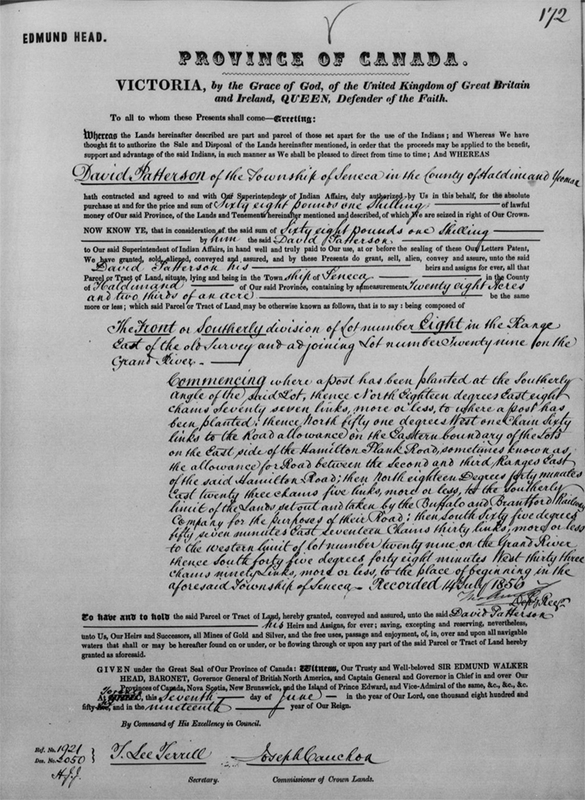 Keep in mind that patents issued by the Provincial Secretary of Upper Canada between 1793 and 1845 are held by the provincial archives, as are the pre-Confederation Indian land sales for Nova Scotia and New Brunswick. What information do I need to find an Indian land patent?